I was able to run three 2 hour runs. One of those includes the workout on Monday, a total of 20 miles, 2hr 20min, with 1000, 600, 400, 1000, 200 meter intervals. A nice long warm-up and cool-down made for a longer day. The other two were Friday and Sunday. Total, I ran four 2 hour days. Besides the three days that I ran 2 hours on a single run, Tuesday, I ran two 1 hour runs. One at the Forest and the other out at Reece's house. Even though I managed to get a lot of long runs in, I still had the Bear Run this past week. This was the 30th Bear Run and Erock wanted a good Field, so a few of the guys from the team ran. It is strange to of been at Shawnee for three years and to of never ran the Bear Run. I mean, for Portsmouth, this thing is BIG, having 870 participants last Fall. This year there were over 650 participants. I knew coming into the race Chuck Wentz and Josh Linkous were my biggest competitors, but still teammates. Chuck has been a beast on the tack this Spring and Linkous is training good after a good time off from an injury. 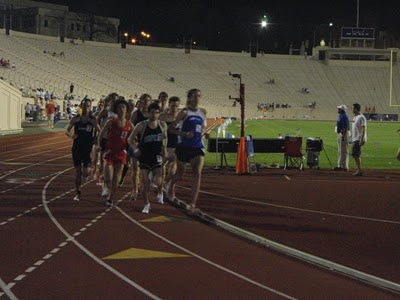 I led from the start pretty much, with Chuck and Linkous right behind me at a 4:50 first mile. Chuck started to fade and it ended up being Linkous and I at the 2 mile in 9:43 for a 4:53 second mile. I felt really strong, and with Linkous having a small base training, I knew I had it wrapped up. Linkous still held very strong down the stretched but I was confident to match anything he had. My last mile was around 4:46, finishing at 15:04, with Linkous 2 ticks back. This was a really consistent race, split wise and I was really happy with the win. Anytime I can represent the Cross Country team well in front of fellow students and the staff at Shawnee makes a win feels pretty good. I won a really nice Shawnee State fleece pull-over and gained a lot of confidence going into the Jesse Owens Classic! Last week was also the last week of Spring Semester. I still have 4 finals next week, but the monotonous class-going has ended for a while. I also finished up my Field Experience for Facility Management. Saturday, I did the announcing at the Men's Baseball Game. It was a fun experience and I enjoyed doing it as well. I will be relieved when finals are over! Even though I had a race and was busy with the end of the semester, I was able to run out at the Forsest four times last week. I believe that is the most times in one week since last summer! With Wysocki running trails and a long weekend, I snuck out there more than a normal week. It gave me a chance to get off the roads in Portsmouth! I just checked and it has been two and a half weeks since doing the 8 mile zig-zag loop in Portsmouth, what a relief! The more I am on dirt trails, the happier I am! My run today at Shawnee State Forest become one of my most memorable runs ever! Reece and I drove out and parked at the end of Hangover Bridle Trail junction, where the Orange Trail crosses Rd. 2. We wanted to see if we could connect the trail to where we turned around Friday, which was at Campground #6, sitting under some nice Hemlock Pines. On our drive out, we managed to get mixed up on the gravel roads. I still have no clue how or why we kept turning in the wrong direction, because we have both been on these roads before, but whatever the case, we popped up at Picnic Point. I guess the new green foliage made us not recognize some things. We finally got to the parking spot an hour later! By this time we were tripped out already! We headed down the Orange Trail and in 20 minutes we got to Campground #6. We browsed around there and realized this was the spot to be in Scioto County! There were many great sites to pitch a tent, it was only a 20 minute run from a road, and there was a 2 creeks converging, making it a fresh water site. The creek also had a nice pool about thigh-high. As we looked around, we found a White Blazed trail and a Bridle trail. We ran 20 minutes out the Bridle Trail first, then back. It was called East Fork Bridle Trail. We got back to the campsite and headed up the White Trail. This trail ended up being a Side Hike Trail which is a part of the North Country Trail (going from North Dakota to New York). We turned around at 20 minutes out that trail, where it crossed Upper Twin Creek Rd. We then headed back to the car and it took a total of 2 hours and 5 minutes. We ran up a lot of big hills and discovered a bunch of new things in the Forest. It is pretty cool to have such awesome features at Shawnee State Forest. The more I run there, the more I realize what I have. We have the Buckeye Trail running through, which goes around the state of Ohio. We also have a section of the American Discovery Trail going through the forest. And as I found out today, we have a nice section of the North Country trail passing by as well! I look forward to discovering more secrets to the Shawnee State Forest and making many more memorable runs! I ended up running 95 miles for the week, the fourth consecutive week doing so. 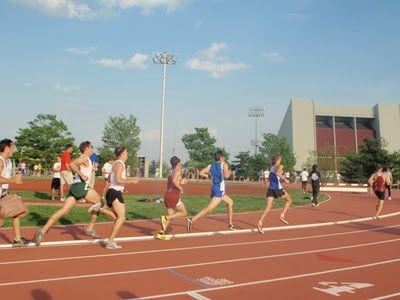 I am confident and ready to end my season with a fast 5k at Jesse Owens on Friday! Through the excitement and final exams that come with the end of a school year, plus the important track meets, Wednesday I stood by Turkey Creek thinking "there is nowhere else I'd rather be right now." Based on the less frequent blog posts in the past few weeks, one could tell that I have been very busy. A couple weeks ago, I made a list of everything I had due from that point till the end of the semester. The list started out with 25 assignments/tests and now is only down to 13. Four of those are finals, 2 more end of the year tests, 3 presentations, and a couple of other assignments. I thought I was going to be pressed for time with everything, but with a great weekend of studying and work, I feel confident in my ability to get everything finished in a sufficient manner. Today, I have finally found time to post something new! Since my last post, I have only ran one meet, which was a few nights ago at Eastern Kentucky. I ran the 1500 for the first time in my life and posted a time of 4:07, which technically speaking is a PR. So that means I am 7 for 7 in racing for PR's this year! It was weird only being in a race for 4 minutes and after I finished it felt like I had not even ran. I was happy to go on a nice longer than normal cool down. Running in general has been going well. The past 2 weeks I hit 95 miles exactly and this week I am at 95 miles again, pending the night run I do later. I will end up around 100 or so. Mainly, I have enjoyed running trails and have spent more time out there than normal. Two days after the Duke 10k I did a 1hr 40min. 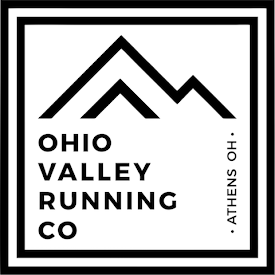 run on a great section of the orange trail. That next week, I ran trails on Wednesday and Thursday, one of those being on the trails in Kentucky. The past week I ran out at the forest twice, enjoying two hours on the orange trail yesterday. During the past two weeks, I also ran a 2hr 30min run back in Meigs County. It has all been enjoyable and I have looked forward to each of my runs as school is consuming more and more of my time. 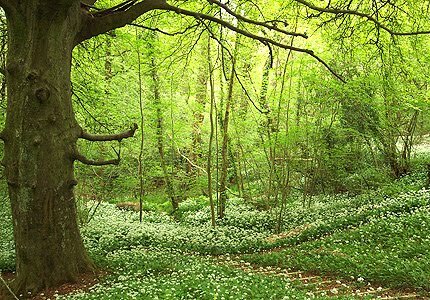 There is no greater feeling then being in the middle of the forest, with new trees in bloom and a cool breeze blowing through my hair. Everything is green and I can feel a sense of rebirth with mother nature and in my legs. I am all alone in these moments and I can hear nothing but the branches swaying as I try to control my excitement. I just want to run as fast as I can, to Run Free! I contemplate the thought of running for hours and hours, but limit myself to only two. Work still has to be done on the track first. Only time will allow me to be able to unleash these emotions. Time will come! I am always excited to get a chance to experience a top notch track meet and especially when it is at a well respected university. The past weekend, we traveled to North Carolina for the second time in three weeks for the Duke Invitational. 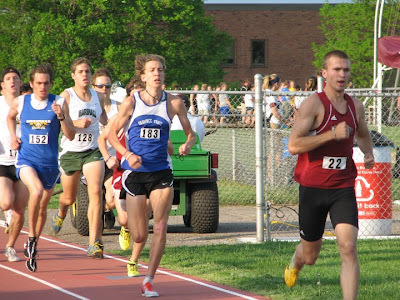 This was the first time I had a chance to run this meet, but the year before I was in college, Eric brought some guys to Duke to race. I had heard nothing but good stories about it. It is also where Eric ran his PR, 14:13, three years ago. So, needless to say, there is always a lot of competition at Duke. I was scheduled to run the 10k at 8:45 pm, under the lights. We drove down to Durham Thursday evening and stayed at a local hotel. All day Friday, it was clear, sunny sky's, with temperatures in the 80's. So, it was very hot. Reece and I was the only guy in the 10k, everyone else was either running the 5k, 3k, or 1500. I enjoyed some nice races from everyone while keeping in the shade and staying hydrated as much as possible. It was going to be dark for my race, but being out in the hot day would still take its toll. Luckily, there was plenty of shade around the stadium. Speaking of the stadium, it was beautiful! 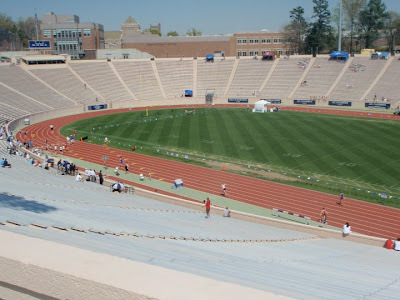 It is one of the only tracks that remain in the football stadium. 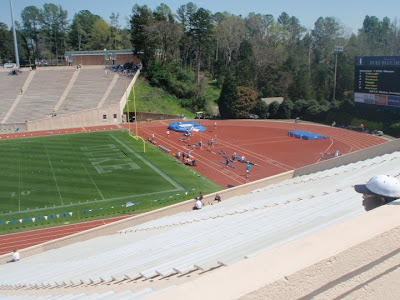 All other schools have separate facilities, which I think is only a temporary fad, and that schools will soon be bringing the track back in the football stadium (if there is room!). Like a well ran meet, the 10k started promptly at 8:45 pm. I was the 5th seeded runner, sent in at 31:00. This was a staggering 2 minutes ahead of my PR from before. I had only ran 3 10k's leading up to this race; one being my freshman year in 90 degree weather at conference (34:16), second being at at Cedarville last year (33:00, winning by a good minute), and third being at Hillsdale last year in 95 degree heat (34:15). So, never really a good race, plus I was never in as good of shape as I needed to be. I started out in the lead. I think it is very important to get on the inside rail in order to run the shortest race possible. It is a 10,000 meter race, but I want to eliminate the chance of running 10,200 meter or something by being stuck out in lane 2. With the fitness level I was at and knowing what to expect of my competition, I was confident in being up front. Shortly though, some other people wanted to lead and I was absolutely fine with that. I just hovered in 3rd or 5th for the time being. After a couple of miles, I was still in the lead pack of about 8 runners. The first mile was at 5:01 and the second split was 9:59 (4:58). Throughout the race, the PA announcer would announce how many people was in the lead pack, that was kind of nice to get an idea of who was behind me. I continued to just stay on the inside rail in the middle of that pack. As we got into the middle section of the race, the pace was quickening and people were pushing for the lead. As each person made a move, I kept telling myself to just go with that person. Mile three was clocked at around 14:56 (4:58) and the first 5k was at 15:33. I think at this time, there was 4 of us in the lead pack. There was a guy from Pittsburgh, Albany, and Winthrop, plus me. After the first 5k, I kept reminding myself to answer any move that the other guys in this pack tried to put on. The key was not to lead though. I casually kept in 2nd, 3rd, or 4th place. We went through mile 4 at 19:53 (4:57). Mile 4 was the fastest mile we had ran, so the race was getting fast and exciting. The lead pack dwindled to 3 people, as the Winthrop guy that led the majority of the race, dropped back a little. During mile 5, it was just Me, the Albany guy, and the Pittsburgh guy. It was great having the entire team and Erock on the back turn cheering me on. Even though I was too focused to hear any distinct instruction, I knew they were there cheering for me and it was great! I kept in 2nd or 3rd during the 5th mile and came through at 24:53 (5:00). This mile was a little slower, but we were still pressing at top speed (or at least I was.) In the last mile, the Pitt and Albany guy really stepped it up a notch. With two or three laps to go, they left me. I could not respond to that move, unfortunately. With 400 meters to go and at the 6th mile mark, I was at 29:59 (5:06) and I ran the last 400 in 71 seconds to put me at 31:11, 1 minute and 49 seconds faster than my previous PR. My second 5k split was 15:38. I ended up getting passed by a guy from Emory and held off the Winthrop guy to finish in fourth overall. Even though I didn't respond to that last move, I still ran a great race. Those guys probably had a lot more experience than me in a 10k. This was a awesome experience and it made me into a much better runner, just based on gaining valuable race experience and confidence to run over 6 miles at sub 5 minute pace. My 5 mile split was 43 seconds faster than my 8k PR (granted that it was on a track). It is also pretty cool that I ran my 5th and 6th fastest 5k times within this 10k. I am looking forward to a couple more races this spring and really looking forward to beginning a nice summer of training for cross country!